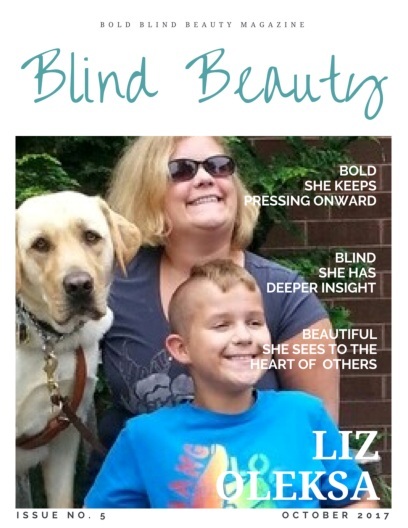 Liz, aka Her Royal Blindness, is the President of the Lehigh Valley Council of Blind. The image is a faux fashion magazine cover titled Blind Beauty. Liz Oleksa, her son, Logan and guide dog Bryce Krispie are on the cover. Liz and Logan are both smiling while Bryce Krispie is looking intensely at the camera. In the photo is Liz, Logan, and Bryce Krispie. Liz is standing on the left, and Logan is on her right. They are both dressed up for Logan’s chorus concert at school. Bryce Krispie, Liz’s guide dog, is sitting in front of her and Logan’s feet. Previous post: Abby’s Reflections #36 | What’s In A Name?